Sports lovers at selected Virgin Australia Supercars Championship rounds will have a new place to congregate when the Hino Sports Deck makes its debut at the Wilson Security Sandown 500 in Melbourne on September 16-18. 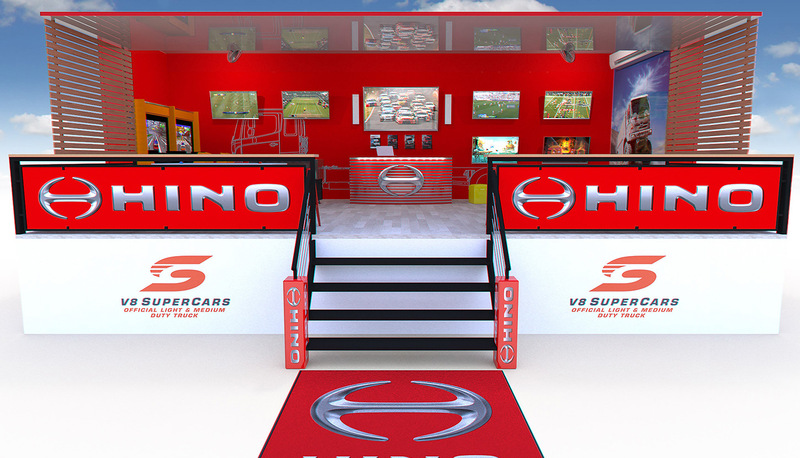 Hino has taken its sponsorship of the Supercars Championship to a new level by transforming a 40 foot container to a pseudo-sports bar, complete with five TV screens, a dedicated kids’ area, fuseball, and even a phone recharge station. “The Hino Sports Deck will be a unique feature at the Supercars rounds – we know that Supercars fans love sport so a 65 inch TV will feature all of the Supercars action while an additional four 49 inch screens will stream the best sport from around the world and Australia,” Hino National Marketing Manager Sarah Rosales said. The container will be transported between rounds by a Hino 700 SS2848 ProShift air prime-mover. With a 353kW/2157Nm turbocharged six cylinder diesel engine matched to a 16-speed ZF AS Tronic Automated Manual Transmission (AMT), the Hino 700 Series also has air rear suspension, Jacob type engine brakes, heated and electrically operated external mirrors, cruise control and a driver airbag. The fit-out work was undertaken by Owlpine Productions and managed by Ellis Management. As the official Light and Medium Duty Truck sponsor of the category, Hino sees the Sports Deck as an opportunity for people to experience its brand and one of its products while also watching their favourite sports. “We know that big and small kids alike love trucks but not everyone gets a chance to get up close to them – at other rounds, we are also hoping to have a range of our trucks on display,” Ms Rosales continued. The Hino Sports Deck is expected to be a fan favourite at all of the rounds it visits - the Wilson Security Sandown 500 (16-18 September), Supercheap Auto Bathurst 1000 (6-9 October), Castrol Gold Coast 600 (21-23 October) and the Coates Hire Sydney 500 (2-4 December). Tickets are still available for this weekend's event at Sandown.